Welcome to the drstephensestate.com website. This website (‘Site’) is owned by Stephens Family Wines. The following website terms and conditions (‘Terms and Conditions’) govern the site. We reserve the right to amend the Terms and Conditions from time to time and advise you to read these Terms and Conditions prior to every purchase from the site. Thank you for your interest in D. R. Stephens Estate. Any information that you provide to D. R. Stephens Estate through joining our mailing list or through an on-line purchase will not be shared or sold to other companies or individuals. All on-line orders placed on our website require a credit card which will be transmitted via secure and encrypted methods. In addition, we use standard security measures to protect the information you give us, but of course cannot guarantee that those measures will always work perfectly. When you join our mailing list, you agree to allow us to send you information via email and/or U. S. mail regarding D. R. Stephens Estate and our wine. If you’d prefer not to receive this information or you are under the age of 21, please do not sign up for our mailing list. We will replace or refund you any bottle of wine that is flawed. We ask that you return the unfinished portion of the original bottle for replacement. By law, we cannot accept returns of alcoholic beverages unless the product is corked, or flawed. If the original shipment was damaged or flawed you will receive a full refund, including shipping and handling charges. Please contact info@drstephensestate.com to discuss refunds or returns. 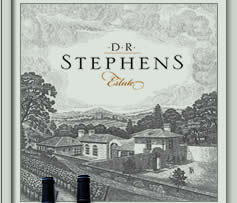 Please contact info@drstephensestate.com for order tracking information. If no one is available to receive the package and it cannot be left in a secure location, two subsequent attempts to deliver will be made. If three delivery attempts are missed, the wine will be returned to D. R. Stephens Estate and you will be charged for a return fee and a new shipment fee.